By day, Gary Para is a counselor for people affected by drug and alcohol abuse. 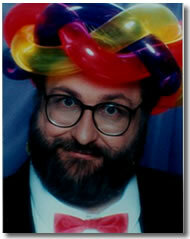 But, by night, he's a very different sort of practitioner, a clown prince of conjuring, and a master of balloon artistry. Gary's zany antics actually began when he was a kid, growing up on Buffalo's east side. His dad owned Archie's Tavern, and, young Gary began entertaining the patrons with his self-taught tricks and stunts. It wasn't until he was 14 that the would-be prestidigitator saw his first magic shop. Hanging out at Gene Gordon's shop on Franklin Street, Gary's interest in magic grew along with his skills. He even joined a junior magic club. But, it was his subsequent introduction to the legendary Eddie Fechter that really inspired Gary Para to seriously pursue his love of close-up magic. Fechter owned and operated the Forks Hotel in Cheektowaga, NY. Gary became one of the house magicians at the magic landmark in the late 1970's. It was there that his career and reputation in magic began to soar. As Gary Para's popularity with audiences grew, so did the respect of his magical peers. A past president of Ring 12 of the International Brotherhood of Magicians, he has also been an active member of the Society of American Magicians. In 2003, Gary received the International Brotherhood of Magicians “Karl Norman” award for his outstanding contributions to the field of magic. But, in the 1980's Gary Para's show business career took a new twist when he was introduced to the art of balloon animals. And, after perfecting his craft at kid's birthday parties, he eventually elevated balloon artistry to something even adults appreciate with humor and wonder. These days, “The Balloon Man”, as he's called, thrills audiences of all ages at the Ship & Shore Restaurant in Pendleton, NY There he not only creates balloon animals, but giant hats and other creations for patrons young and old. In addition, he's a favorite performer at festivals and celebrations, such as First Night and Taste of Buffalo. Finally, we think you should know that Gary Para has also used his magic and balloons to help troubled young people fight their abuse of alcohol and drugs. Just ask the teenagers at Renaissance House, who learned magic, balloons, and a thing or two about self esteem from Gary Para. But, don't take our word for it, give Gary a call and find out for yourself why this magic and balloon man is in such demand. He's available for everything from media interviews and demonstrations, to trade shows and private parties.